A state agency with 18 offices around the state needed an efficient check voucher system for generating that would replace its paper-driven, manual process. The agency came to Crow Canyon to provide an automated system using Microsoft SharePoint that would be more accurate, faster, and easier-to-use. The system also needed to be able to show status of any request in progress and provide reporting on historical voucher data. The Check Vouchers, which are used to request payment on an invoice, start in any of the local offices. The voucher must go through a series of approvals at the local office before being sent to headquarters, where the financial department gives it a final review. Once approved, the information is automatically passed to the financial software and a check is issued. With the Crow Canyon system, all vouchers are generated electronically and are routed, using SharePoint, to the appropriate approver. Notifications are sent to the approvers; alerts are issued when a voucher sits unapproved for too long. Any voucher request can be tracked and its status known throughout the processing. The person who generated it and other interested parties can keep abreast of its progress. The status of the voucher is visible to anyone with the right access permissions. The voucher is delivered instantly to headquarters upon the final office-level approval. The financial team at the main office can quickly review it and then simply click a button to output it to the financial software. Once the financial software intakes the voucher, a check can be issued at the next check run. At the same time, all parties involved can be notified of the payment being made. 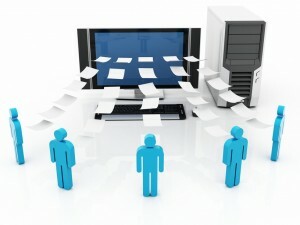 With this transparency and fluid movement, the SharePoint-based check voucher process developed by Crow Canyon has saved many hours for the originator, the approvers, and the financial department, resulting in quicker resolutions and less confusion and consternation over when an invoice will be paid.